I always thought chopsticks looked cool but I could never get the hang of them. The half hour in a chinese restaurant every month or so wasn’t enough time to figure it out. Then one of my best friends went on a trip to Japan and brought back a pair of chopsticks for me as a gift. I felt silly at first because I didn’t know how to use them. She gave me a few lessons and I decided that to really get the full effect I would give up using forks for 1 year and only eat with chopsticks. It worked great. It only took me a few weeks to master it but I kept it up for the full year. I even had a pair of emergency chopsticks in my car in case I was at someone’s house and an unplanned meal came up. I confused the people in the lunchroom at work. A few asked me if I was adopted and my parents were asian. They so fun to use. My little sister and I raced on who would get the hang of them the first.I won. Hehe, yeah, my family actually forced me to learn how to use chopsticks when I was little, after an emberassing incident involving a pair of chopsticks and a severe nose bleed at a high class chinese returaunt. Also, I like the idea of eating with only chopsticks for a year. I don’t get it, honestly… a fork is an easier way to pick up food that you desire to eat, pinching it between two sticks of wood isn’t as quick as just spearing it… so why go with something LESS efficient? i own 10 pairs of chopsticks because i like eating with them and keep buying sets i think are pretty. Ironically, I don’t like Asian food. Chopsticks are definitely more efficient than forks! And they’re multi-purpose. They replace everything except a knife. Even a spoon. You can drink soup with them. How do chopsticks replace a spoon? They can’t scoop stuff better than forks can. >.> …Forks can be used as a knife more than a chopstick, too. You’re missing the point, FFF. You look totally cool if you get it right. They do! I’ve got a titanium camping spork I carry with me everywhere, in case of eating emergencies. Just google “titanium spork” and something ought to come up. In answer to the whole fork/chopstick issue, chopsticks are better because the extra effort required to eat only make the food taste better, for accomplishment is a great sause that goes with everything. And sporks totally trump both their asses. That would make a good fortune cookie saying, wouldn’t it? Ahh…chopsticks. I love those things. That and I can eat jello with them! Chopstick can easily replace a spoon, just hollow them out. Sooo…to replace spoons, turn chopsticks into small, useless, wodden spoons? I had a friend from japan, and when I asked him if I was using my chopsticks correctly, he told me “It’s only incorrect when you drop your chicken down your front.” and proceeded to show me some of the strangest chopstick grips I have ever seen. Cricket – that was SHEER BRILLIANCE. 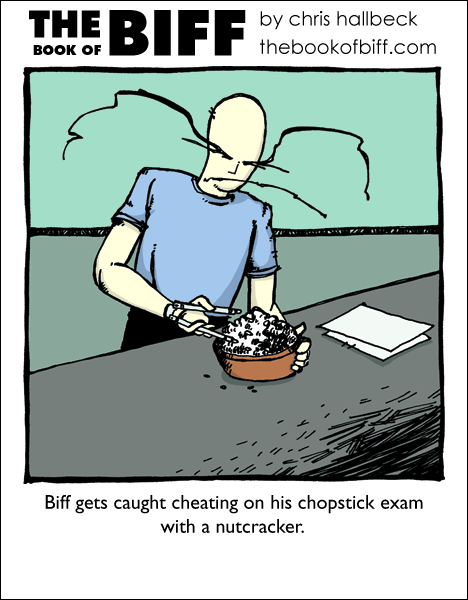 I used chopsticks once, but got frusterated and ate them instead. I still say it would be easier to eat everything with those big salad tossing forks. I have thirty-odd pairs of wooden chopsticks I brought back from Japan. You know, the kind where they’re stuck together and you snap them apart. Their equivalent of plastic cutlery. I also have a few gift pairs that are really elaborately decorated, and I enjoy eating with them simply because they look nicer than my normal cutlery. oh well. theyre good for noodles. and other than that, yeah use forks and spoons. I am very skilled at such a simple thing as chopstick use. My parents are starting to think I was switched at birth. Okay okay im tellin u chopstix r the best because they r exotic AND sophisticated! That plus its a cool way to spear the hands of relatives who like plate shareage! BADASS!! Am i right or am i right?! Chopsticks were more popular in the olden times because they were easier to carve than forks. My little brother is great with chopsticks. He eats ice cream with them. Chris, you do FANTASTIC hands. I love chopsticks. I’m really good at them but eating icecream with chopsticks makes it taste better. Agreed, Nero Rose. Giant utensils FTW! They have exams for that? That sounds good for confusing people, you get more food per bite compared to chopsticks, and you look much more skilled compared to using a single spork. Chop-sporks for the win! If you’ve been to Japan and Singapore and stuff and the real great Asian food, you’ll love it. I’ve had 3 exchange students from Japan live in my house so I’ve known how to use them for many, MANY years. I’m so skilled with chopsticks, I can take a pair in each hand and use western cutlery with the chopsticks. I used chopsticks for the fist time last week. By the end of the meal I was pretty well able to pick up single grains of rice. The hardest part of the meal for me was the broccoli. also, nutcrackers ought to be called nutcrappers. because they are crap. Now those things you use to eat crabs, (you know, the ones that look like nutcrackers but have like a sharp edge on the inside and are a little bit smaller? )those are awesome.